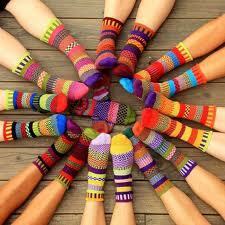 It’s become my motto: “Be your socks!” A philosophical way of being that allows me to abstain from making a “good impression” by my outter image and instead, just be comfortable BEING – in whatever mix matched, hole-y (holy), imperfect way that I present myself to the world. Back in November of 2012, I found my way to my very first exposure into Expressive Arts Therapy. For several weeks leading up to my random find of this creative, FUN, introspective therapy field, I’d been seeing myself leading groups with an experiential nature. Occupational therapy, my original degree’d field, had many of these same qualities, but it didn’t seem to fit in my mind’s eye. I could see myself doing something, namelessly…..frustratingly……”other”. Similar…..but “different”. But what the hell was it? Expressive Arts – as an actual field of study – has only been around since the early ’90’s. It focuses on the philosophical idea of “poesis” that in forming art, we can (re) form our life. It encompasses all art forms – music, voice, paint, dance, writing, – often using more than one together to allow freeing expression as well as allowing the art to speak to us in ways that aren’t consciously recognized. It holds a philosophy of “low skill (anyone can benefit, you don’t have to like or be good at art) “high sensitivity” (revealing much to the person within the experience). Because it is so new, degree programs are still only offered on either coast. Whether it’s fashion, hair styles, attitudes, lifestyles, or career advances – likely you’ll find the newest trends on either coast of the US before it meanders its way into the center of the country. Our midwestern St Louis town, though quite modern and more of a thriving city than I’d ever imagined in my “high society” town of Columbus, Ohio, still is behind the times in Expressive Arts. To find any kind of learning opportunity, I needed to travel. Unable to do so for an entire 9 months of the year as my children are either doing, or set to in the next year, I needed something that would allow me shorter periods of travel away from home. I was lucky to find that in New York Expressive Arts, which has a “Post Graduate Certificate” that is achieved over 3 intensive weekends in one year’s time. And led by a (prior) occupational therapist, which seemed incredibly synchronistic. Everything within me felt pulled to this program. I never felt so sure that this was right for me. So much so that an incident with my daughter earlier in the week that was so severe to cause me to drop out of the year program, depleted me with shock filled tears. I was so sure I was to be there, this year! Not next. It was not surprising then that the Universe worked my life situation around so completely that I was able to re-sign up just a day later. It felt so right to me that I began walking to class that first day, though I’d forgotten the address, I was unconcerned. I just knew I’d find it. I knew I’d found my place while walking up the steps, finding phrases on the wall that I’d recently entered into my journal. It was surreal, that feeling of walking into….my self. All throughout the weekend, we gather in circle, a sacred space to ourselves which is another synchronicity. Especially within the last 7 years, I’ve been joining in circle – whether through 12 step meetings, my writing group, Women’Space retreats, or other spiritual gatherings….it’s always been around this same circle of sacredness. It’s of no wonder that I felt pulled. I thank the Divine that I was so opened up at this time of my life that I could heed its calling. Every time we enter into this circle, we are asked to remove our shoes. Symbolic for the declothing we do before entering, leaving our exterior selves outside this space, we each take a space on the floor in our stocking’d feet. Readjusting, feet crossed under, one leg extended or both…..our socks often meeting in the middle of the circle, closest to the sacred inner flame. We participate in a variety of artful experiences that open ourselves up to our innermost self in ways that we’d not considered. Igniting new thoughts, recognition and understanding. (Re)Forming the pictures of ourselves. At the end of that first weekend, one of the young women exclaimed to me, “Laurie, the whole weekend I’ve been noticing your socks! The first day, one was inside out. The second, they didn’t match and were so worn, you could see the tread of your walking on the soles. And now today, one has a hole so large, you’ve wrapped a big piece of tape around it to keep your toes from sliding through! It’s become my motto: “Be your socks!” A philosophical way of being that allows me to abstain from making a “good impression” by my outter image and instead, just be comfortable BEING – in whatever mix matched, hole-y (holy), imperfect way that I present myself to the world. And hopefully, in doing that, it allows others the courage and humility to do the same. So I make this call to the world — be your socks! Wrap your arms around the holy, imperfected and magnificent one that is YOU…..and just BE! I’m a “middle aged” wife, mother, writer and artist somewhere in the middle of my younger self: good-girl-with-rebel-(sometimes)-hidden and my older, wiser self: live-your-life-honestly even if it hurts (cuz it always hurts longer and deeper to hide). I’m a seeker of Truth and Wisdom, finding it in wider and wider circles, sometimes right in the midst of ordinary existence. It’s a passion to try to catch that in words so that I can awaken again, day after day.